What Roggeveen saw were apparently bonito canoes, or va'a alo, which were still in use when observed by Te Rangi Hiroa in the first third of the 20th century. As their name suggests, these were used for bonito fishing, and they were considered essential accouterments of chiefs and other high-ranking Samoans. Indeed, large bonito (those over 24" long, called skipjacks) were reserved for chiefs, and the common fisherman who caught and ate one, instead of turning it over to the chief, was subject to having his house burned down and his crops destroyed. Many other taboos applied, including a rule against stepping over a va'a alo during bonito fishing season, and the obligation of the owner to provide the builders with gifts and the finest of foods during construction. Va'a alo were paddled by two or three men who would watch for seabirds hovering over the water, waiting to catch the prey fish of fast-moving predatory bonito. The fishermen would paddle through a school of bonito trailing a shell hook or gorge from a rod and line. If, while bonito fishing, the fishermen encountered a shark, they would gather in the line and attempt to capture the shark with a lasso. 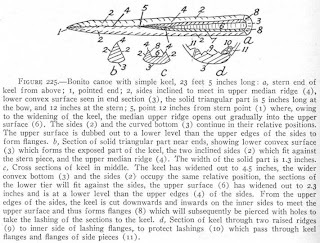 "The bonito canoe (va'a alo) was built for speed so as to keep up with the schools of fish being pursued by the bonito. To obtain speed, the hull had to be made as light as possible. The size of the canoe was no problem as trees larger than the canoe were readily obtainable and were used in the soatau and 'iatolima types. To get the hull thin enough, it was easier to control the thinness of the material by dubbing out short sections of planks than by excavating the whole hull in one piece. Of later years, better control over a one-piece hull has been obtained with the sharper steel adzes, and has led to the manufacture of dugout bonito canoes. Before the advent of steel adzes, however, the technique of the plank bonito canoe had become established and many craftsmen despise the dugout bonito canoe as not being true to type. The manufacture of the plank canoe came within the field of the guild of expert carpenters. The canoe is made in the old style except for the use of steel adzes." Profile of the hull, with plank section layout, keel, stempiece and sternpiece. The bow is to the right. The complexity of va'a alo construction illustrates why plank-built boats were rare among societies that could build dugouts adequate to their purpose. Adzes were the primary tool used in construction: steel when it became available, and presumably stone or shell before that. Before the steel bit and brace became available, a conical shell with spiral whorls was used as a bit. Lashings were of braided sennit made from palm-leaf fibers; the mid-ribs of palm leafs were used as sewing needles to pass the lashings through the holes. 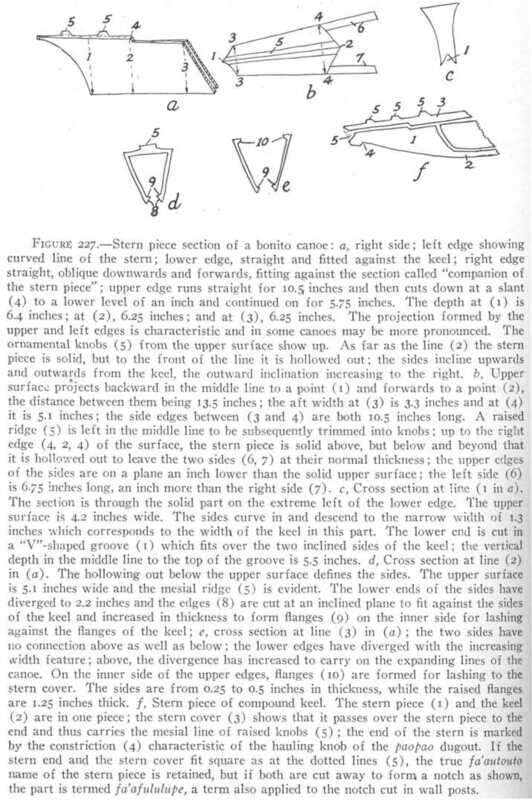 Plan and sections of the keel. Va'a alo were built upon a keel, which was carved to a careful, elaborate shape designed to provide secure lashing and watertight joints for the first row of planks. 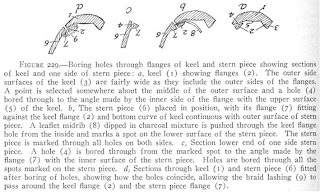 Two styles of keels existed: a "simple" keel with a relatively straight profile (but complex plan and cross-sections), and a "compound" keel, with a sternpost and the lower portion of the stem carved as integral parts. An example of a simple keel recorded by Te Rangi Hiroa measured 23'5" long, 4.5" maximum width, and 2.5" maximum depth. 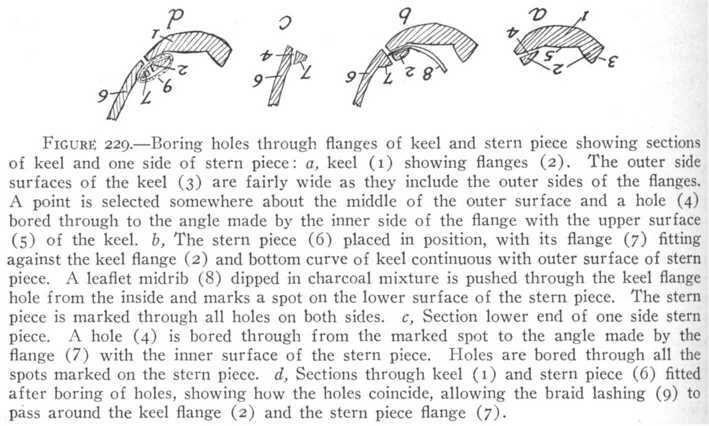 Keel bent against building posts. 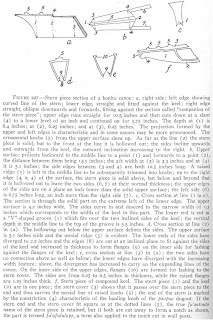 The keel (of either type) was set up on posts inside a boat shed or a vacant house, with props against the roof beam to force it into the desired curve. The first strake consisted of five plank sections per side, each with a predefined shape and its own name. The bottom edges of the planks fit into a rabbet in the keel, and pieces were carefully mated for a watertight seal by repeatedly rubbing the keel with red earth, trial fitting the plank sections, observing where the clay transferred to the mating piece, then dubbing off the high spots. Blind holes were drilled through the inside surface of the planks and keel, and the pieces were sewn together with braided cord (sennit). 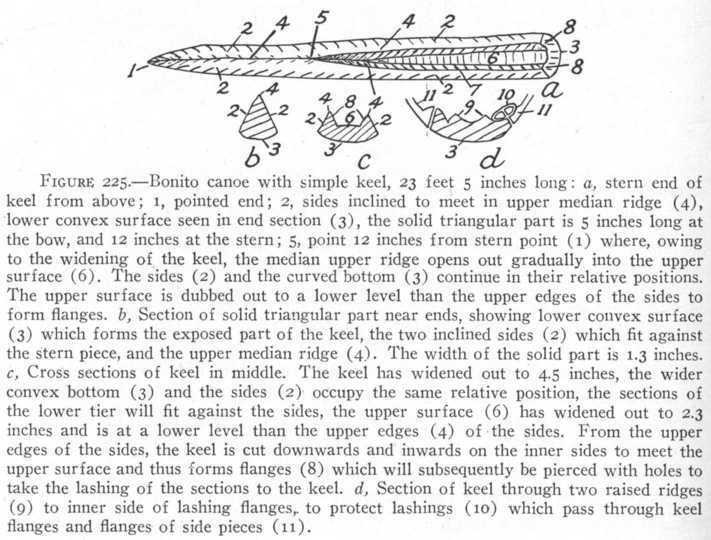 In some canoes, a pair of parallel ridges ran along the top surface of the keel, allowing the fishermen to sweep a canoe bailer lengthwise along the bottom without interference from, or damage to, the lashings. Lashing of keel to lower plank sections. The plank sections of the upper row were not so strictly defined as the bottom: the available raw material determined the shapes, and the pieces – typically four per side – did not each have their own name. Plank section (inside surface) with integral strengthening ribs and cleats. The inside surface of planks was carved with integral ribs and foot braces. Lashings between planks were made through holes bored through a cleat running all around the planks' perimeters. The thickness of the cleats and ribs was 1.5 inches, but between them, the planks were thinned to just 0.25 to 0.5 inches. This greatly lightened the boat, giving it the speed capability needed for the bonito fishery. Probably the most complex pieces of woodwork on the va'a alo were the ends. Whether carved integral with the keel or as separate pieces, the stem and stern pieces featured numerous details designed to ensure secure, watertight joints with the plank ends. The mere length of caption to Hiroa's illustration (above) gives some idea. Bonito canoes had bow and stern decks which were decorated with knobs, and sometimes with valuable shells, along their centerline. Running between the decks on both sides and sewn to the top edge of the upper strakes were gunwale timbers, which both strengthened the hull and raised the topsides by two inches. 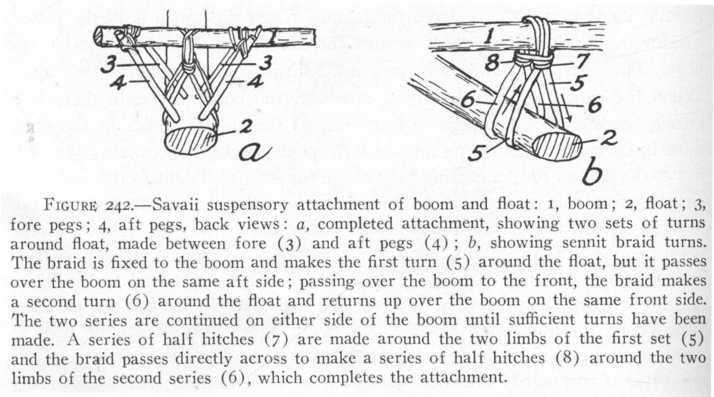 Arrangement of outrigger float, struts, and boom. 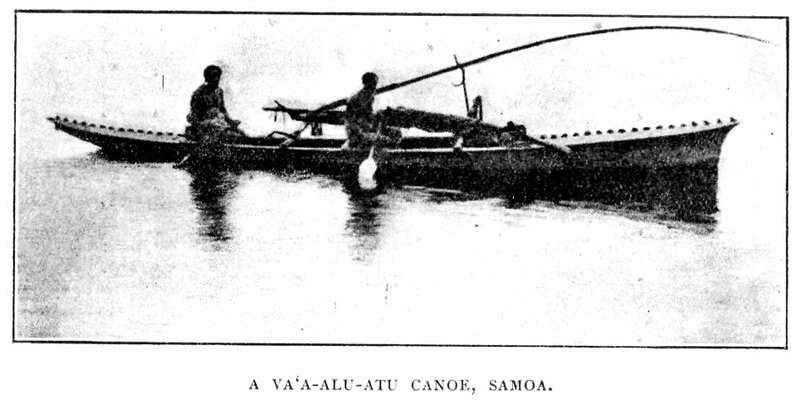 As on Samoan dugout canoes, the outrigger float was on the left side and was cut off blunt just abaft the aft boom. It was not parallel to the main hull's centerline, but instead angled slightly inward toward the bow. The float was attached to two straight booms through pairs of angled struts. 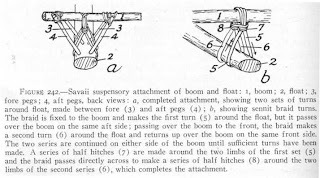 A third boom, between the other two, did not attach to the float, but served as "a brace to the gunwales, a back support to the front seat, and an additional means of carrying the canoe if needed" (Hiroa). The va'a alo was the last native plank canoe used in Samoa, and it was already on its way out when Hiroa wrote about it in the 1920s. If any remain in use, they are almost certainly heritage-minded recreations rather than true working boats. Most content and all images except photo from Samoan Material Culture, Te Rangi Hiroa. Kava Drinking Ceremonies Among the Samoans And A Boat Voyage round 'Upolu Island, Samoa, S. Percy Smith.